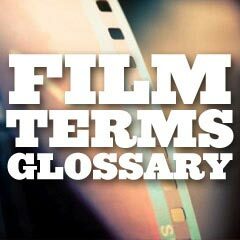 tap a slang term, meaning to "pick", "select", "name", or "appoint"
theme music the opening or closing music of a motion picture, often containing the film's 'signature' or leitmotif tune/phrase that is associated with a character or situation within the film Examples: 'Laura's theme' in Laura (1944), John Williams' shark music in Jaws (1975). A 'title' card (or intertitle) from The Crowd (1927). Saul Bass' cleverly-designed titles for the opening credit sequence of North by Northwest (1959). tone the mood or atmosphere of a film scene, often revealed by the director in the way a film is directed, e.g., serious, humorous, satiric, amusing, etc. topline to star; or to be billed above the title of a film; the topliner is the star of a particular film Example: Bette Davis, top-billed or starring in the melodrama Marked Woman (1937), with lesser billed and lesser-known actor Humphrey Bogart. tour de force literally "forceful turn" (French); usually refers to a lead actor's performance that was incredibly skillful, brilliant, notable, masterful, reflecting a very high standard, and perfectly displaying the actor's ability; compare to 'stealing a scene' - the equivalent for a supporting actor role Examples: Rosalind Russell in His Girl Friday (1940) as Hildy Johnson, and Jack Nicholson in One Flew Over the Cuckoo's Nest (1975) as Randle P. McMurphy (pictured). trades refers to the professional magazines and publications that report the daily or weekly entertainment news of the entertainment industry. Examples: Variety, and the Hollywood Reporter (pictured here), and Boxoffice Magazine. trailer a short publicity film, preview, or advertisement composed of short excerpts and scenes from a forthcoming film or coming attraction, usually two-three minutes in length; often presented at the showing of another film. Historically, these advertisements were placed at the end of a newsreel or supporting feature and so "trailed" them, hence the name; also commonly known as preview(s); also, another name for the tail - a length of blank leader (strip of film) at the end of a reel; a teaser is basically a very short trailer (of 15-30 seconds in length) that only provides a few hints about the film (a Web address, a few bars of music, a quick sequence of images, specially-shot footage, etc.). trash film refers to second-run, low-budget films that are deliberately over-the-top, infantile, amateurish, sometimes excessively gory or raunchy which are intended to shock, disgust, and repel mainstream audiences, and appeal to non-traditional audiences. Sometimes described as a sub-category of exploitation and cult films, or called a 'turkey' film. Compare with sexploitation, B-films, and Z-films. Examples: Films distributed and produced by Troma Studios, the splatter films of Herschell Gordon Lewis, Paul Morrissey's Trash (1970), John Waters' Pink Flamingos (1972) and Female Trouble (1974), William Sach's The Incredible Melting Man (1977), Meir Zarchi's Day of the Woman (aka I Spit on Your Grave (1978)). triple threat refers to an actor or actress who can sing, dance and act skillfully and equally well on a consistent basis; usually applicable to performers in the musicals genre; it also could refer to a person who can act, direct, and screenwrite! Examples: Fred Astaire, Ginger Rogers, James Cagney (pictured, from Yankee Doodle Dandy (1942)), Deborah Kerr; also Orson Welles, Charlie Chaplin, Warren Beatty, Woody Allen, Robert Redford, etc.